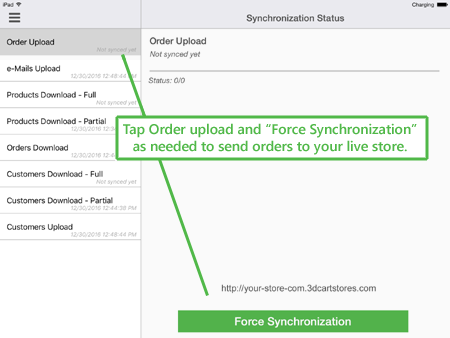 On this page, you'll be able to review the last time orders were synchronized to the store. Additionally, you'll see a button at the bottom of the screen labeled "Force Synchronization." Tapping on this button will send the orders up to the store for centralization, archiving, and follow up purposes. 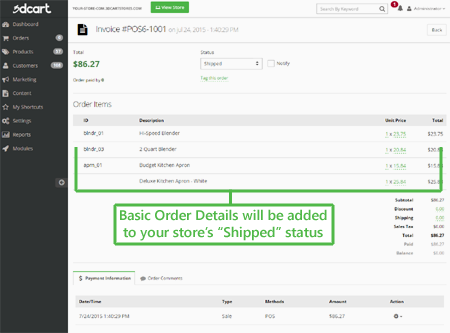 Orders sent to your store from the POS App will automatically be placed in the "Shipped" status since they are - for all intents and purposes - already fulfilled. Furthermore, since the orders were placed using the POS App, they will not contain identifying information such as customer name or email information. If this is information that you would like to retain for your records, we recommend using the "Add Notes" functionality of the POS order process to capture that information.